I love bringing home left overs from our parents homes and seeing what meals I can create from them, but I especially love bringing home fresh vegetables and fruits! One of my favorite meals growing up was your standard white potato, cheddar cheese au gratin. Although this meal can easily be made gluten free and vegetarian, it is not very high on the nutrient scale. I try to cook dairy free for Ryan, so I challenged myself by making this typically cheesy, creamy nightmare, dairy-free. And, you know me. I had to add protein somewhere, so I used silken tofu as the base of my “cream” for the “cheese” sauce. You won’t see any photo of it though, because it’s not very pretty. 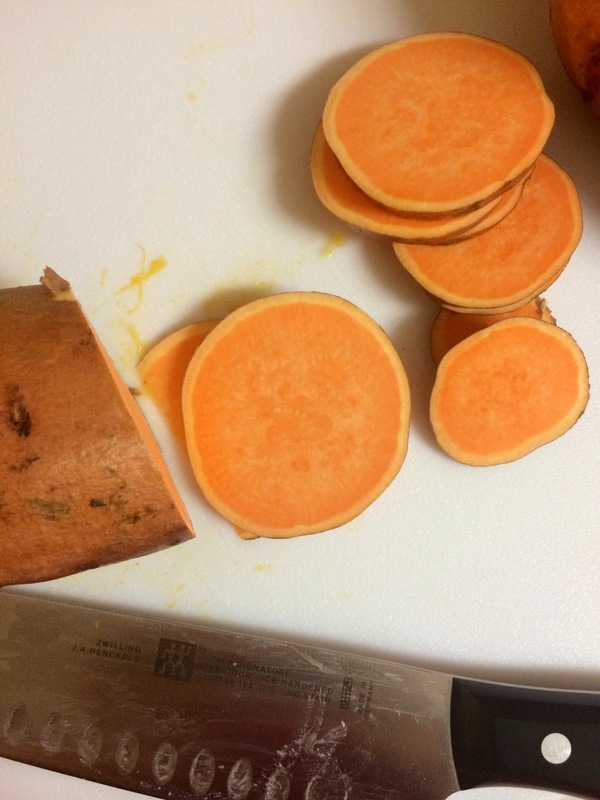 The acorn squash and sweet potato are both vitamin-rich vegetables, much better than your typical white potato. 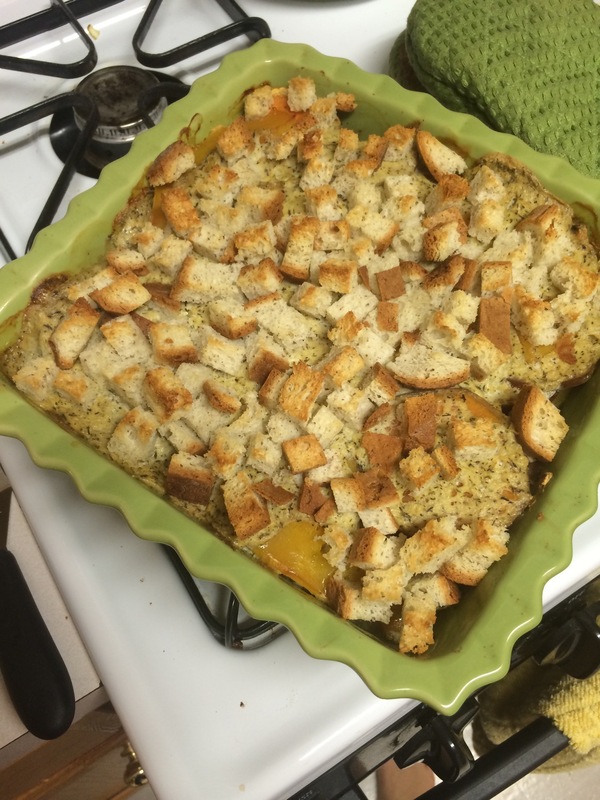 This hearty casserole ended up being very filling and yummy! 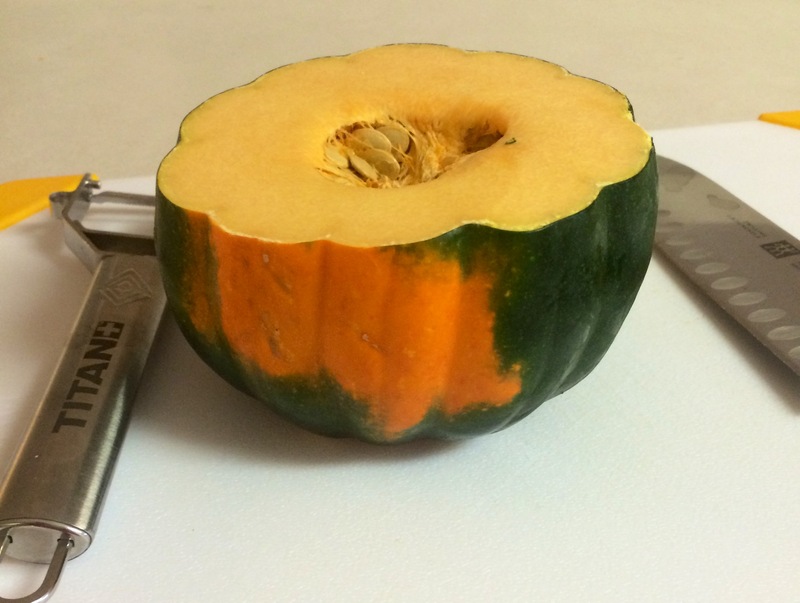 Peel squash & scoop seeds out of center. Side seeds aside in small colander. 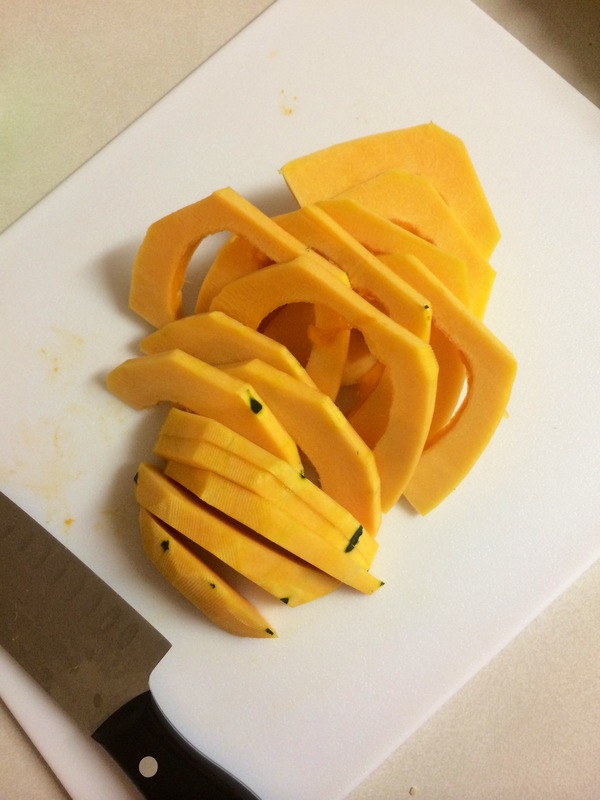 Slice squash into 1/3 inch slices, maintaining consistent size slices as much as possible. 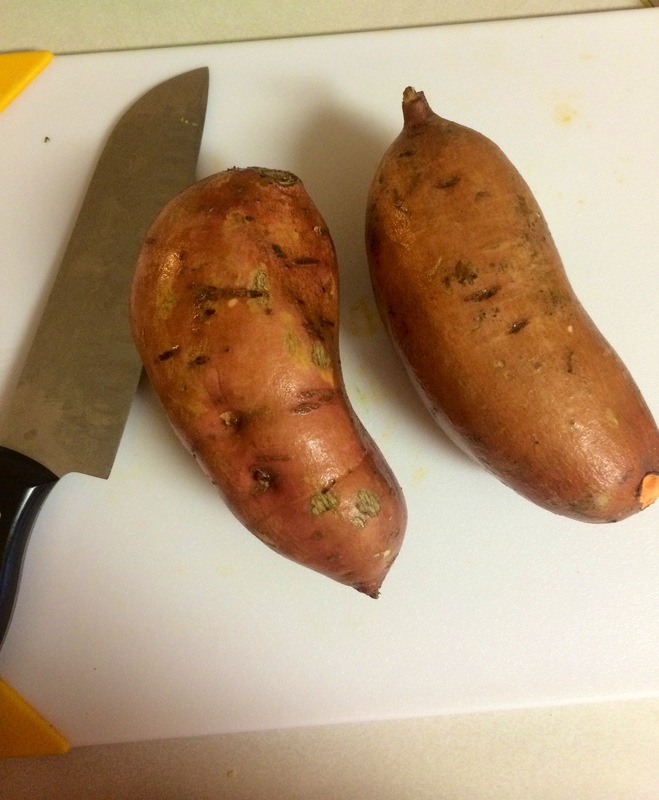 Rinse and brush visible dirt off sweet potatoes. Slice into 1/3 inch rounds, maintaining consistent size slices as much as possible. 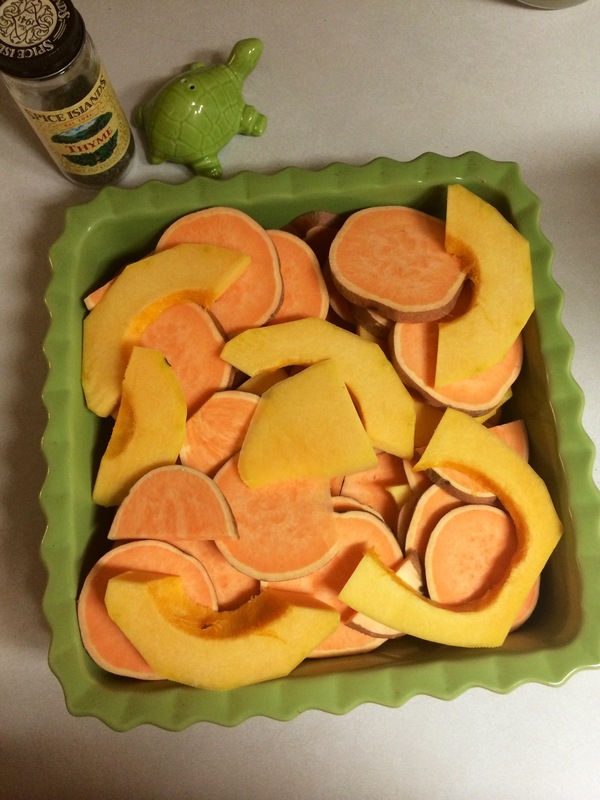 Arrange squash & sweet potato in a 9×9 casserole dish so that the baking dish is evening covered. Pierce the tofu container and drain any liquid. Put tofu, thyme, salt, pepper, nutritional yeast, garlic, thyme, and milk substitute in blender. Blend until smooth. Pour your tofu mixture over your squash. Place your dish in the center of the oven and lay a piece of aluminum foil loosely over the top, do not fold it over the sides. You want steam to be able to escape. Lightly spray your bread with olive oil (I use this Misto) to ensure that it gets crispy, and slice it into small cubes. Set aside. Bake for 30 minutes with foil tent, then remove from oven and sprinkle with your topping. Bake for another 15 minutes without the foil. tip: after 30 minutes, pierce a piece of squash & a piece of sweet potato with a fork. It should be soft. If it’s not soft, put it back in for another 10-15 minutes before adding the bread crumb topping. Depending on how ripe your vegetables are, it can lengthen the cooking process.